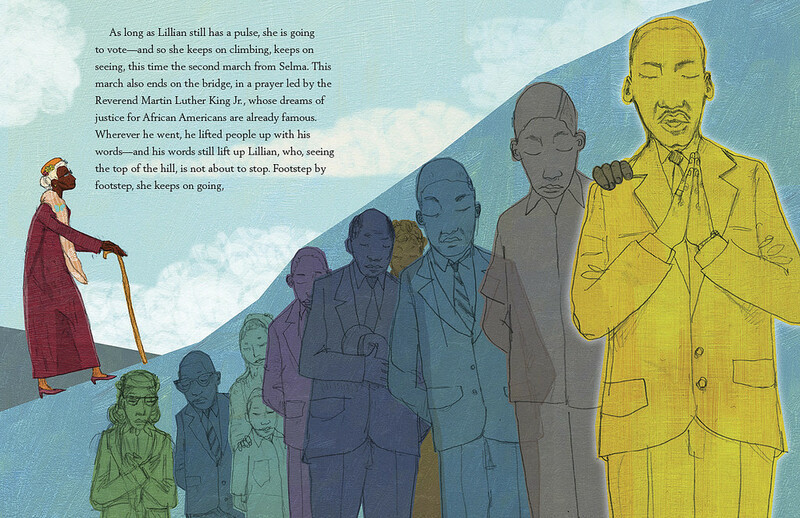 How do you take something unwieldy, complex, and often painful to look at—like, say, the history of voting rights in America—and turn it into a picture book that is engaging, relatable, and understandable to kids? (4) Illustrate it with vivid, powerful images. Not that I know anything about it. 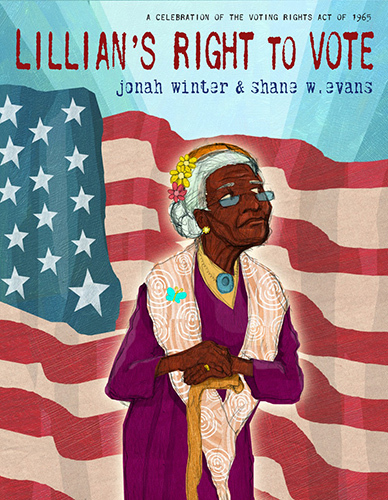 I’m just looking at how Jonah Winter and Shane W. Evans pulled it off in Lillian’s Right to Vote, a beautiful new book published to coincide with the 50th anniversary of the Voting Rights Act of 1965. As Winter explains in the Author’s Note, the story was inspired by Lillian Allen—the granddaughter of a slave—who was 100 years old in 2008 when she campaigned and voted for Barack Obama. The steep hill is a nod to the neighborhood where the real Lillian walked door-to-door urging neighbors to vote. But her arduous climb also serves as an effective metaphor for the struggle for equal voting rights. As the fictional Lillian trudges uphill, she reflects on her ancestors and the long and difficult history that led to her ability to vote on this day. 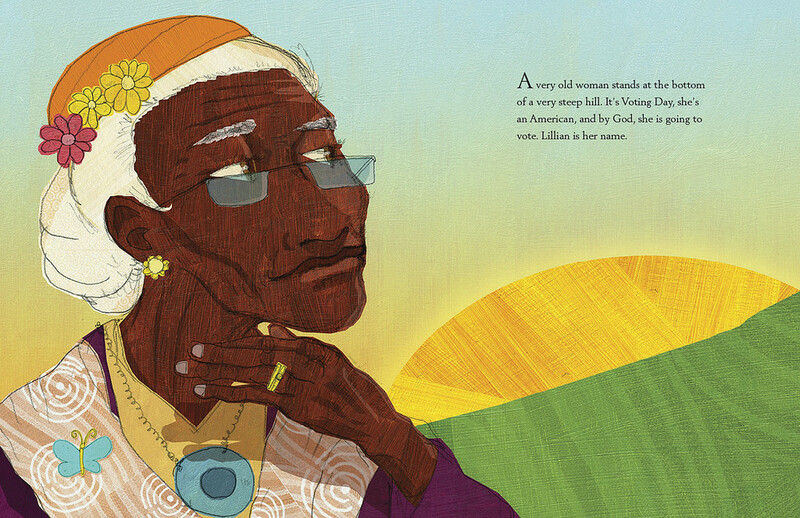 A few steps later, Lillian sees that same baby—Edmund, her great-grandfather—as an adult voting for the first time, thanks to the passage of the Fifteenth Amendment in 1870. But since that amendment applied only to men, his wife can only stand by and watch. As Lillian continues her climb, she recalls setbacks—things like poll taxes, voting “tests” (“How many bubbles are in a bar of soap?”), and incidents of violence and intimidation. But she also remembers great leaders and important achievements—like the Nineteenth Amendment, allowing women to vote, and, eventually, the Voting Rights Act of 1965. 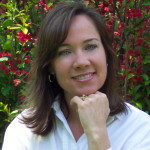 The book is written in present tense, giving it a “you are there” immediacy. We walk beside Lillian, seeing what she sees, as she climbs the hill, enters the building, and steps into the voting booth. Through Winter’s solemn tone and Evans’s powerful illustrations, we feel Lillian’s struggle, her sense of weariness and strength, as she at last arrives at her destination. My son is part of that generation and will be voting for the first time in the next presidential election. I’m going to hope that the answer is yes. Jonah Winter, Lillian's Right to Vote, Linda Ashman, non-fiction, Shane W. Evans. Bookmark. May I have another fraction of pizza, please? Thanks for sharing this book with us. Awesome look at history. It really is, Tina. I think your students (and kids) would like it. I just stopped over at your blog. I hope you’re all happy in your new home, and that you’re enjoying teaching again. Your classroom looks great! I have a friend who is 103 years old and still lives in her own home. She reads two newspapers everyday. She still goes to the “beauty parlor.” And if someone asks her how old she is, she says 87. I’ll have to get her LILLIAN’S RIGHT TO VOTE! Your friend sounds amazing, Kathy. I bet she’d love the book! I just read this a couple of days ago and absolutely LOVED it. The text is lyrical and so moving, and the illustrations are absolutely stunning. This is the perfect text to supplement studies on civil rights too. It reminded me of The Autobiography of Miss Jane Pittman in its approach–a highly effective one. Thanks, Maria. I absolutely agree! wow, such an inspiring story…can’t wait to get my hands on it! thanks for sharing. Thanks, Rochelle. It really is inspiring. I wasn’t aware of this one, and it looks terrific. Thanks, Linda. It IS terrific–like most of Jonah Winter’s books (I’m a big fan). Wow, this is on my must-read list. What a great nonfiction picture book ! Thanks, Nicole! It’s a beauty. This looks like an inspiring and lyrical picture book. I will order for my library right away! Thank you for sharing. This one sounds WONDERFUL. Will definitely be giving it a look – thanks, Linda! Great post, Linda! I found it interesting that the story is told in present tense, which seems like a surprising and effective way to approach a story from history. This inspires me to try switching one of my current stories to present tense and see how it changes. Thanks for featuring this book! Writing in present tense is such a great strategy. It can make a text feel so much more vivid, like you’re right there with the characters. I hope it works with your manuscript. Let me know! Looks like a great new non-fiction. Can’t wait to read it. Thanks, Virginia. Definitely check it out! What can I say? LOVE nonfiction biographies, especially a beautiful book like this which tells such an important story. I like how it layers on the importance of voting with each step up the hill. It really captures the emotions that go with voting. I miss that feeling now that I vote by mail. The approach to such a sweeping topic surprised me. I’ll be thinking about this for a long time. Thanks! 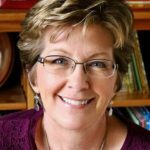 Love this post, LInda, and looking forward to loving this amazing new book. Thanks PBB for making me aware of so many great stories that I otherwise would have missed.